This is the current shop. 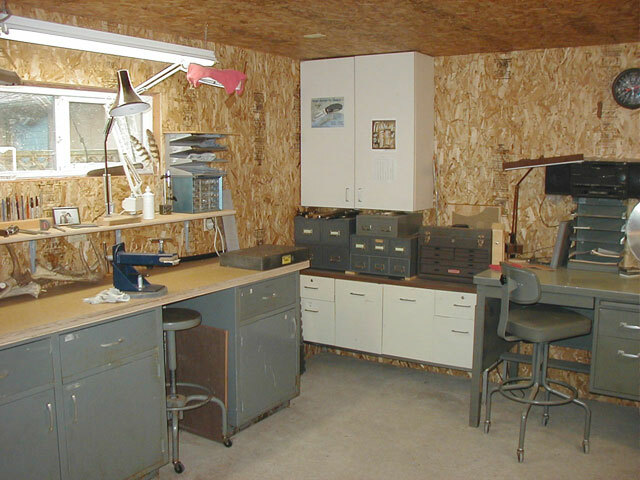 This shop is made up of three rooms: the main Cutlery Shop, a separate Grinding Room and a separate Woodshop. 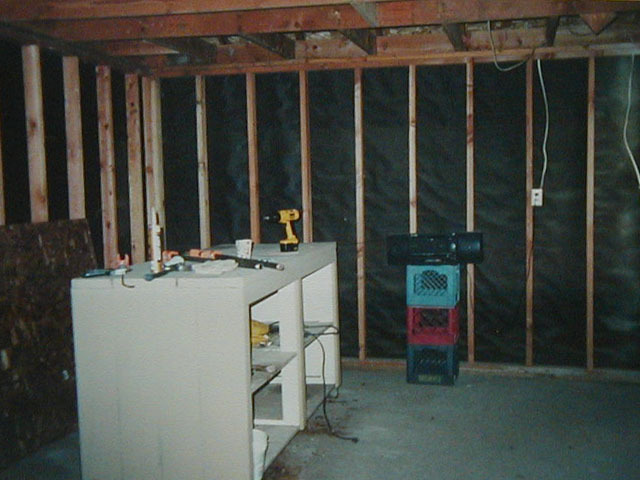 When we purchased the land, house and this building (which is a two bay garage with two rooms on each side), I had to start by rebuilding the entire south wall because it was rotten and had a fairly thriving population of termites making their living there. 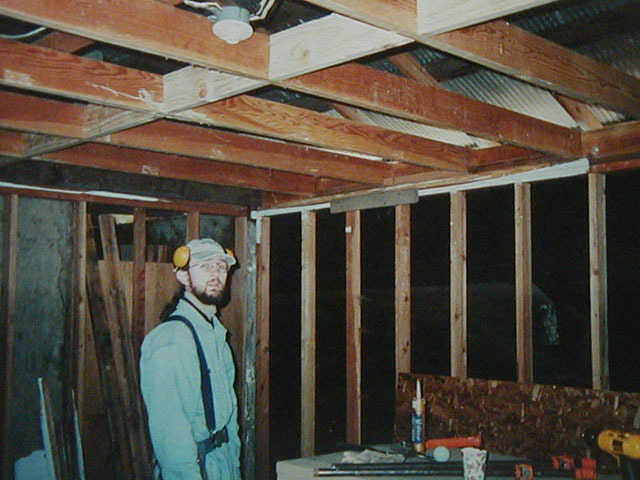 After installing three windows and four doors, building three walls, putting in a 60 amp subpanel and wiring the three rooms with dedicated lighting, multiple 220v and 110v circuits, insulating the ceiling and walls and sheathing the entire thing, it ended up being a fairly nice place to work. I did all the designing, framing, wiring… well, everything, myself (well, I did get some help from my wife) so I am kind of proud of it. 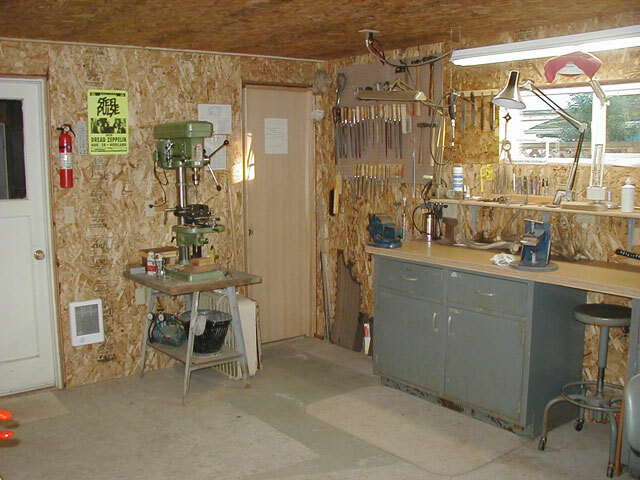 The rooms may be small, but they are easy to heat with radiant oil and cadet heaters so they work fine for now, and this shop is much more than I ever had in the past, so I am happy. Almost all of the “furniture” in each room I salvaged from dumpsters, for free. 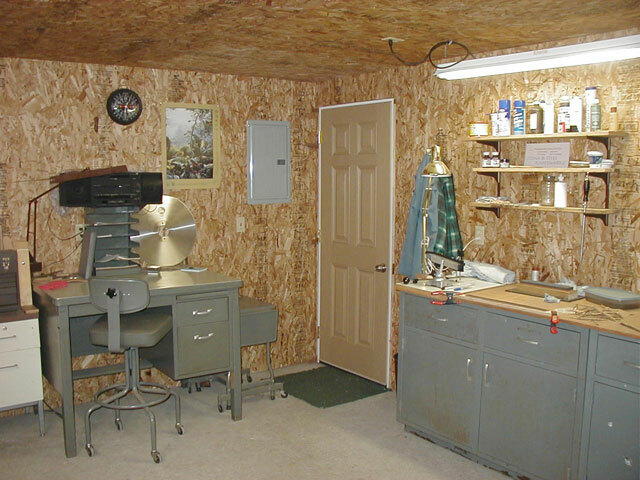 I built all the bench tops and the bench in the Grinding room. 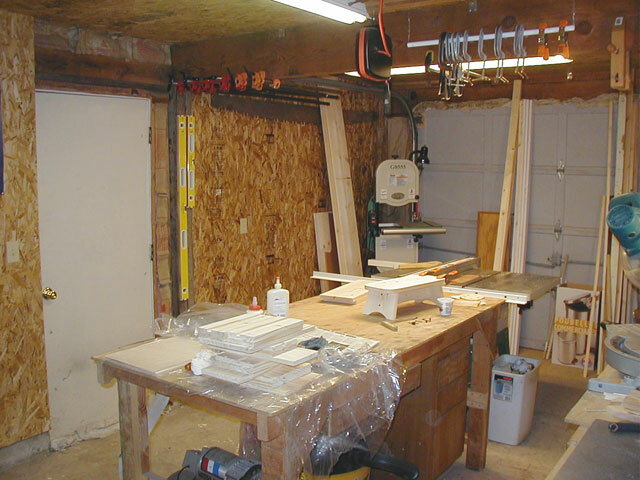 Of course the shop will probably never be completely finished; lots of little things that still have to be done, but we should be here for a while, so I should have plenty of time to work on it. 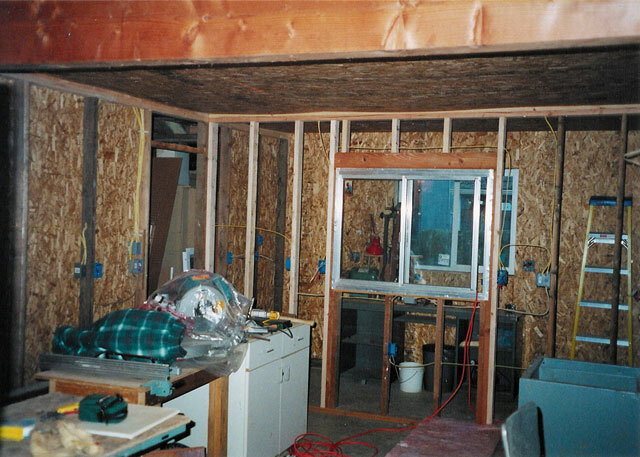 I have included a few pictures of what it looked like when I started. 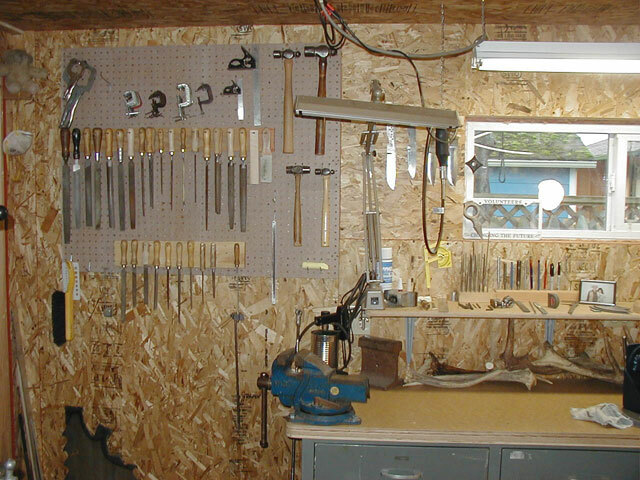 I would like to emphasis that it is possible to have a fairly “nice” shop and good tools on a very tight budget. I doubt I would be considered monetarily wealthy, but, I am patient, a fairly good scavenger and am skilled at fixing, modifying and making the best of what others throw out. As I mentioned elsewhere, almost all of the benches, chairs, desks cabinets, etc came from dumpsters and demolitions, a few from garage sales. I keep my eyes open and am not afraid to ask if someone is throwing something out if I can make a deal on it, and they usually just give it to me so they don’t have to haul it to the dump. I think the real trick is knowing your limitations, both in skill and space, and knowing when to go after things that you know you can use, and passing on those that you aren’t sure about. Scrounging can lead one to begin to take anything home because “it was such a good deal”, “hey, I could save a bundle if I could figure out how to fix that” and “I might be able to find a use for that someday…” That is fine, and I have been guilty of it, too. 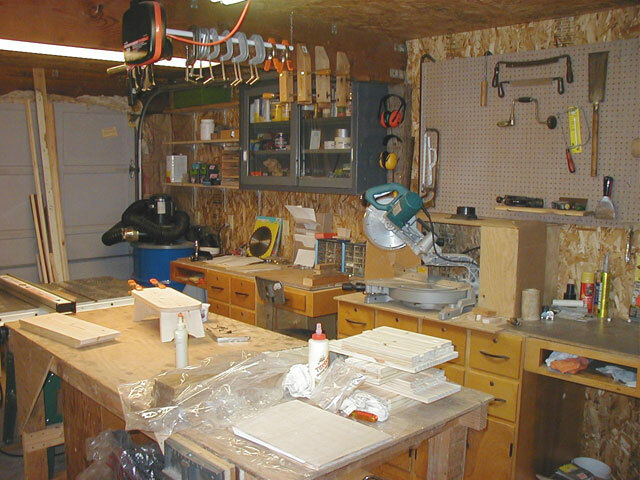 But just try and not fill your shop to the point you start moving it into the house; that may not work out so well. I have acquired the tools over many years of patience, flexibility, watching sales, visiting used stores and garage/barn sales and spreading the word. It adds up over time. I feel that because I went about it this way, I have grown to appreciate what I have much more than if I had just bought everything new outright to start with (even if I could have). 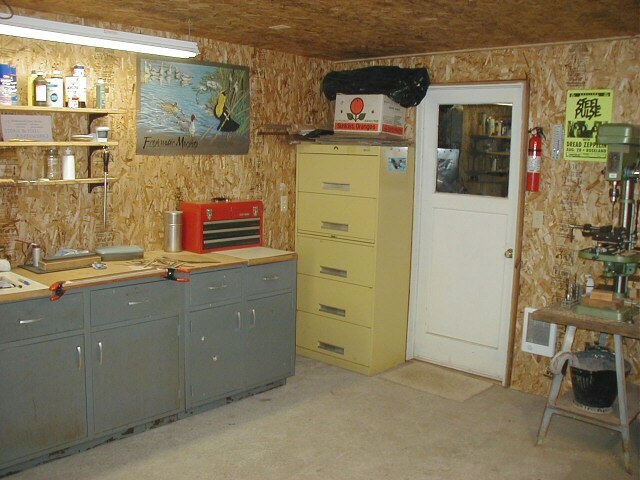 Looking toward the northeast corner of the Cutlery Shop: End of sharpening bench; a storage cabinet (old file cabinet with roll out doors); door to Woodshop and my old cheap but effective Harbor Freight drillpress. Note the fire extinguisher and cadet heater. 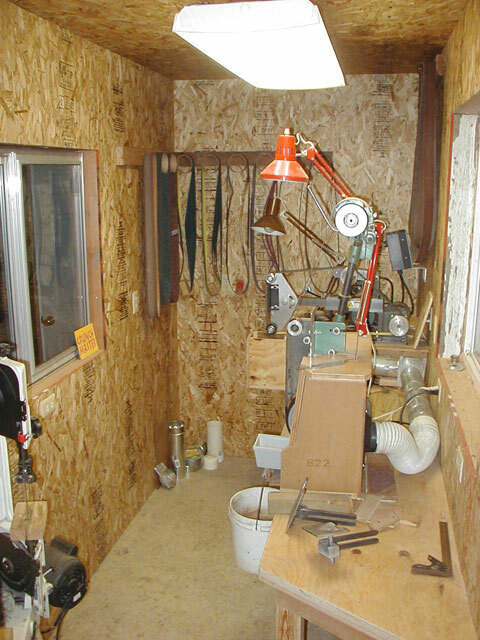 Looking southeast in the Cutlery Shop: The drillpress; the door to the Grinding Room and the east end of my main bench. 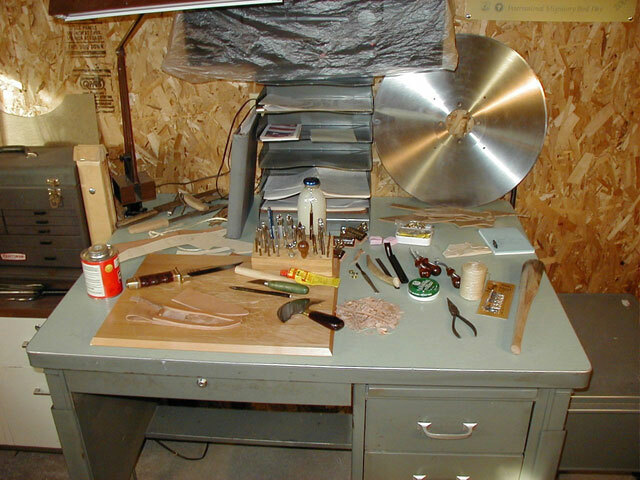 The southwest corner of the Cutlery Shop: The west end of the main bench; storage for various parts and material and a wall cabinet for more storage; the machinist chest; desk where I do most of the leatherwork, etc. Note the stereo; got to have tunes! 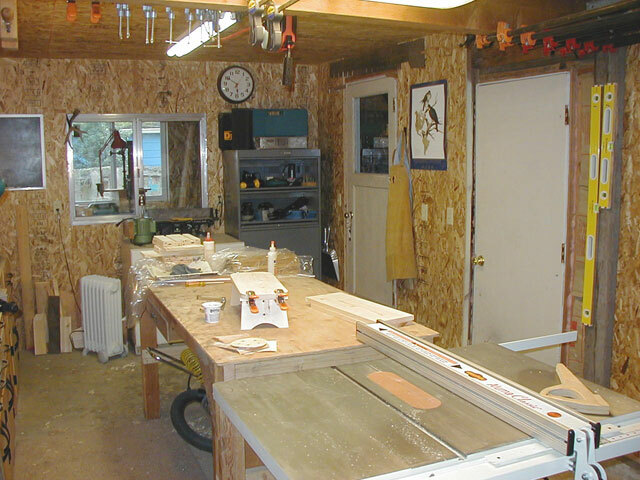 Looking toward the northwest corner of the Cutlery Shop: The desk; the subpanel for the shop and garage; the main entrance door from outside; the sharpening bench and a storage shelf. 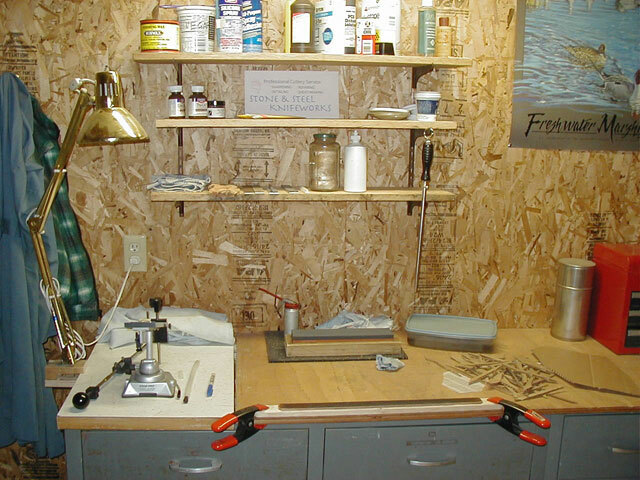 A close-up of the sharpening bench, with my EdgePro sharpener on the left, a Norton stone in the rear and a strop in the foreground. A close-up of the desk with a custom sheath in progress for an older Al Mar SOG. A closer view of the main bench. The bench top is constructed of four layers: the bottom is ½” CDX plywood recycled from a shipping crate, next is a layer of ½” particle board recycled from a remodel, then another layer of new ½” CDX plywood. These layers are all glued together. The surface of the bench top is a sheet of ¼” masonite screwed to the bench top so that it can be replaced when it wears out. All corners and edges are rounded. This bench top is then screwed up from underneath to the metal bench units. All in all, pretty solid. I considered using plastic laminate (used for countertops), but prefer the feel of wood, and find the laminate to be a little slick, although it would last a lot longer. Looking into the Grinding Room: The Grizzly, KMG-1, grinding belts on the back walls and the unfinished dust evacuation system. 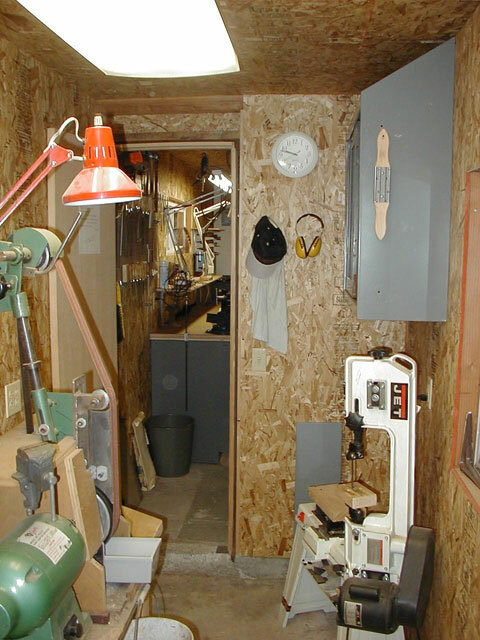 Looking back toward the Grinding Room door: Grizzly grinder, Jet 4×6 metal bandsaw and the cabinet that holds my buffs and compounds. 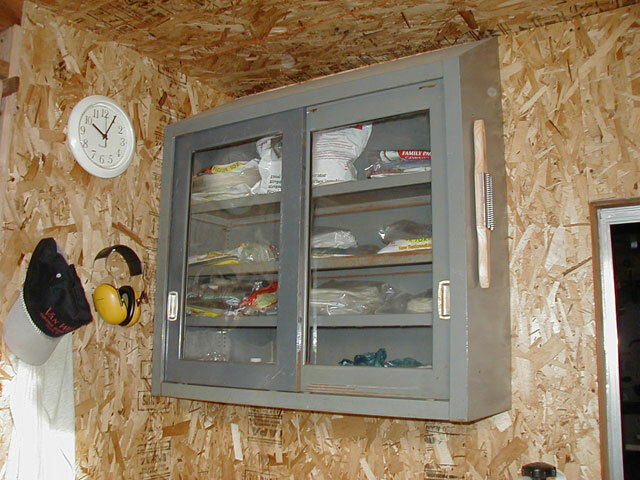 This is the steel cabinet where I store my buffs and compounds, all sealed in recycled ziplock tortilla bags (yea I eat a lot of tortillas, what is your point?). 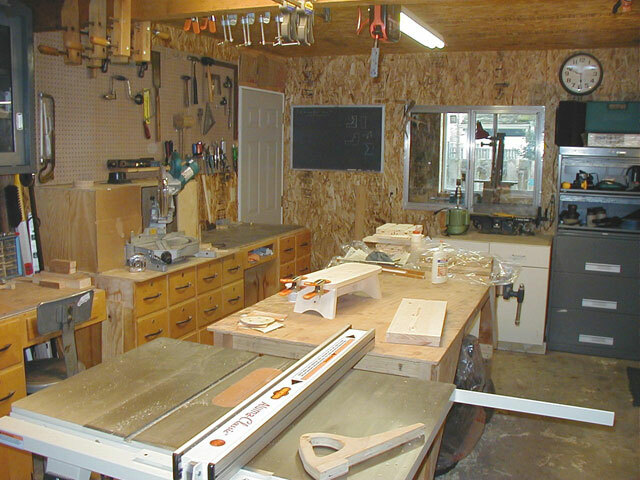 Here are some photos of the small Woodshop, which allows us to work on remodeling our old farmhouse and where I will be building furniture and toys for our child and our daycare. I have several Grizzly tools in here, and highly recommend them if you are looking for some very well made tools at very reasonable prices. Many of their tools are far form low quality imports. Stumbled across your website while searching about getting a Henckels 8″ (made in china) back in usable order after foolishly leaving it on a pizza tray in a preheating oven…whoops. -Just spent the last couple of hours poking around the web, (always interesting). I liked your site. You have made some interesting and beautiful knives. 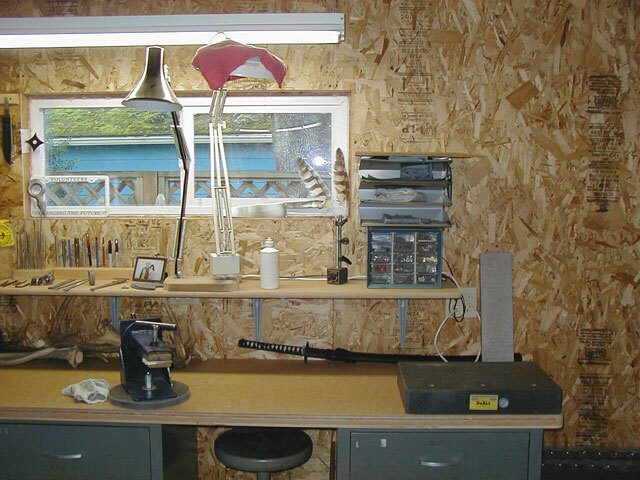 I like that you have the pics of knives you made back in high school. I have always enjoyed knives as far back as I can remember and still have most of the ones I’ve accumulated over the years. I Was kicking around the idea of making the knife into a sheath knife or at very least putting new slabs on it. I don’t know how reshaping the steel into a new shape/size would affect any heat treatment of the steel? It is a simple stamped piece but I imagine the steel is of high quality? (marked German stainless Steel 11310-200). Thoughts or comments would be appreciated or even possibly if you would have any interest in helping me make this happen? Thanks for the complements on my work and the site. Most early frontier knives of this continent where kitchen/butcher knives modified (or sometimes not modified, just given a sheath for carry) for field use. Also, in many cultures the distinction between a sheath or field knife and a kitchen knife is bury as most people have only one knife and use it for all things: in the kitchen, in the bush, etc. We are blessed (cursed?) with so many options, and therefore so many specialized tools. As far as damaging the knife while grinding, just go slow, grind without gloves so you can feel the blade heating up and stop before it gets too hot. In order to get the steel hot enough to damage its heat treatment, you would not be able to hold it, so grinding while holding it with bare hands is a good guide. If you go slow and keep the blade cool by dipping it in water or stopping regularly you should be ok.
Make sure you dull the edge before starting ANY work on it to be safe. Hi, You have a very nice shop. You keep everything SO neat. I can hardly walk in my little shop area. As I age I get less neat. Just had my 79th birthday.